While Max for Live may look daunting at first, it's actually surprisingly easy to get going on your own custom effects. 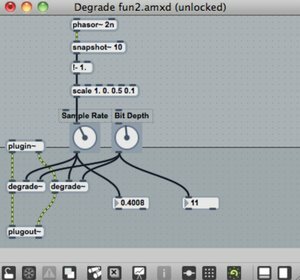 In a new tutorial, MacProVideo's Rishabh Rajan shows how to make a modulated bit crushing effect with Max for Live, using the degrade~ object in Max. In the end, you'll get a bit crusher with tempo-synced sample rate modulation and a Live-friendly GUI.